Smartmatic’s electronic voting machines were used in Santo Domingo de los Tsáchilas. Photo: El Comercio. 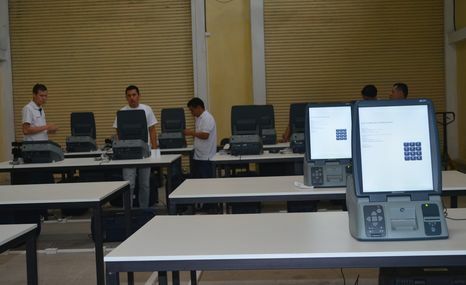 Last February, during its sectional elections, Ecuador took an important step towards the modernization of its elections as it carried out three electronic voting pilots in selected provinces. Simultaneously, in all other provinces, the electoral commission used technology to process the votes, from counting to results publishing. 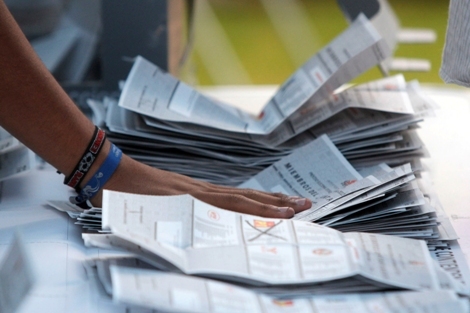 The Union of South American Nations (Unasur) recently released its final report on these elections, praising the results of the binding e-voting test, as well as the organization, training, and logistics of the process. However, it also expressed disapproval of the automated result processing system used in manual precincts. Unasur’s assessment is based on the fact that, while three provinces used different electoral automation models successfully, the Spanish company Scytl failed to perform its duty in the rest of the nation: digitizing poll counts for their later consolidation and publishing. According to the report, “the system was ill equipped to process the amount of information generated simultaneously, which made its timely processing difficult and made errors evident.” Besides, it was clear that this was not the first time that the system performed poorly. “The repeated lack of adjustments indicates that the company has not contemplated all the requirements for its use in elections. The provider behaved negligently by insisting on using procedures and mechanisms that are inadequate to this end.” This situation hampered the promise of presenting nationwide results in 78 hours, as their delivery actually took more than a month. In the other hand, Unasur acknowledged the optimum performance of the three types of electronic voting tested in Ecuador. It specially highlighted the technologies used in the two provinces where the results of the pilots were binding: the one deployed in Santo Domingo de los Tsáchilas, provided by Smartmatic, and the one used in Azuay, from Magic Software Argentina (MSA). The institution expressed its satisfaction over the performance, vote secrecy preservation, contingency resolution, and general fulfillment of the goal of automating voting and safeguarding people’s intent. After a complex but comprehensive experience showing the benefits that a correctly applied technology offers, Ecuador now has the possibility to transition safely and successfully to vote automation. Unasur recommended carrying out “conceptual re-engineering to redefine all the processes inherent (…) to recount and publish of results,” aspects where the system failed due to the provider’s inability to fulfill requirements. 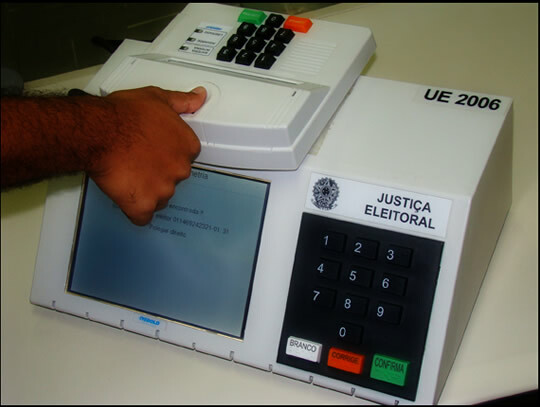 Brazil uses electronic ballot boxes with number keyboards and a biometric identification system. After hosting the World Cup, Brazil has less than three months left to organize the upcoming 5 October general elections. The electoral campaign has barely started, but the country is already busy preparing to automate all of the stages of suffrage: voter identification, vote registration, scrutiny, aggregation, and transmission of results. Brazil has been using electronic voting for almost 20 years, and along with Venezuela, it is considered one of the pioneers in the adoption of electoral technology in the world. The vast amount of voters (141.8 million) and the complex logistics of Brazilian elections pose a challenge the country has already overcome multiple times. So far, the only reported downside of the nation’s automated process is the fact that the voting machines do not print vote receipts on paper, which would enable comparing electronic results with printed votes in order to solve any possible concern. Brazil’s voting machines have two memory cards and a magnetic disk for data storage. After polling places close, several minutes are printed with the results of the election, and another one is stored in the magnetic disk. This last copy is transmitted over an exclusive secure network to the computers at the regional courts and at the High Electoral Court. The system goes under several audits and requires electronic signatures from all stakeholders. Four years ago, over one million voters were able to use the identity verification tool, but now it will be 23 million as authorities continue to expand the reach of biometric authentication to strengthen electoral guarantees. Brazil —the sixth largest economy in the world— is ready to vote in October knowing that it has the best option to deliver results that honor the people’s will: electronic voting.